We've all heard of Google Glass and cars that steer themselves. While they may not be widely popular yet, you can bet the concepts will become more important with time. I had the opportunity to watch a cool presentation by TrendOne on technology that will come out within approximately the next decade. Whether you're writing near-future science fiction or just interested in how our lives will change, you might find my four-part series "Beyond Google Glass – The World in 2025" interesting. Some of these products are available today. Some are receiving the final polish and will be introduced within the next decade. Based on the examples that were shown, tomorrow's technology will be interactive, hidden or embedded, and include artificial intelligence. Let's start with hidden technology...embedded in items you can wear. Click the links to see videos or articles about these up-and-coming Wearables. Why only use e-ink for eReaders? How about making your own e-ink bracelet? Choose a new design every day or upload your own. Smart jewelry can have many functions. For example, it can tell you if you've been in the sun too long, unlock your front door or control your smartphone. Turn your arm into a touchscreen with this Cicret bracelet. Intelligent textiles can have technology woven right into the fabric. They could check your health and send automatic messages if you're in distress. Eee, I'm stretched too much. Cool it on the snacks! 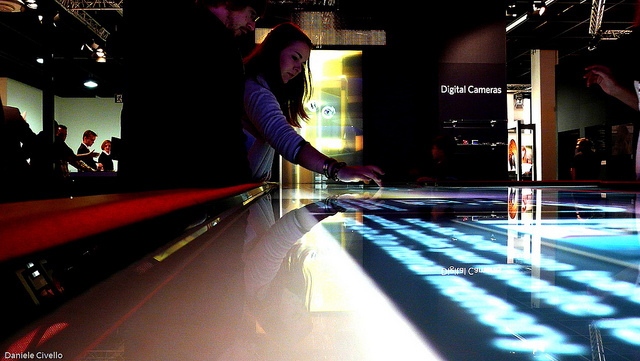 Hidden technology can also be embedded in other items you use every day, like Interactive Surfaces. See this example from Perch - interactive technology for retail. You pick up a shoe and tap to see the sizes and colors available on the table below it. Your kitchen scale can also be a cutting board and display recipes at the same time. The people at Bezalel academy are turning car windows into games. Transparent touchscreens make the back seat of your car into an activity center. What do you think of the interactive surfaces? Can you imagine using them? How about the wearables?